Of all the Caribbean islands, I think Barbados is the friendliest. Everywhere we went, people offered genuine advice on what to see and where to go. Most of the time there was no point, other than a chat and a drink. We met Jade at The Club, who then was at the Oistins fish fry and we hung out all night. Barbadians live for telling a good story, whether it’s about a nail-biting BMX race in the rain or the local grandpa who can put away a gallon of rum a day. Lots of people love to play the “Six Degrees of Kevin Bacon” too – but with Rihanna! The easiest way to experience the island is to book one of the top all-inclusive resorts in Barbados. You can both enjoy fabulous food and activities on the property, and easily explore the rest of the island too. There are some near Bridgetown and the airport for convenience, but I enjoyed best going a bit off-grid and relaxing at The Club – which is on the same road as Rihanna’s 22-million-dollar mansion. As part of the Elite Island Resorts, The Club is a breezy island resort on the west coast that caters to an adult-only clientele. Spacious rooms surround the three freshwater swimming pools, as well as suites lining the gorgeous ocean coastline. Ours had an open-air living space where you could hear the waves, and a massive king-sized bed and jacuzzi tub too. The vibe is tranquil, welcoming and ideal for a relaxing girl’s getaway or couples’ escape. As one of the top all-inclusive resorts in Barbados, the meals and drinks, as well as water sports, entertainment, lounge access, and fitness activities are all part of your unlimited experience. A typical day at The Club started with a massive made-to-order omelet and pancakes at the Sunset restaurant. After, we’d go for a swim in the sea right outside our room (we spotted a small octopus one day!). The Club doesn’t have a full sandy beach, but there’s a big area for swimming/snorkeling and plenty of lounge chairs near the shore and around the pool/grassy areas. We might indulge a spa treatment in the afternoon, or have a piña colada at the beach bar. Looking for great snorkeling gear? Here’s a perfect snorkel gear guide to help you out! If feeling more active, you can try out the paddleboarding, kayaking or even sailing. Dinner was either back at sunset with a tasty pre-fixed menu, or a special night up at Enid’s, which offers more traditional Barbadian cuisine. A nightcap is best had back at the piano bar, or simply in the room loungers overlooking the ocean. While we could have stayed on property at The Club the whole time, they made it easy for us to explore other parts of the island and get a sense of the local vibe. The Club can arrange Barbados tours for you, or you can venture out on your own. There are all sorts of Barbados tours you can indulge while on the island. If you plan to do one of the longboat excursions, it’s worth splurging to ensure your comfort. It can be a long day in the sun with lots of rum punch! This goes for any of the tours – with transport regulated by an island-wise taxi service and most hotels (like The Club) offering shuttles to everything you’ll want to experience. Here are the best Barbados tours I found during our week on the island. A day out on the turquoise waters surrounding Barbados is just about perfect. Taimi will take a medium-sized group out for a ½ day, all included, to simply enjoy the sunshine. We were greeted with mimosas, then had fun sitting out in nets over the water while Barbadian music played in time to the lapping crest of waves. There are a few stops to snorkel by the shipwrecks, which are a couple of hundred feet off the coast of the famous Carlisle Bay. Lunch was so good, especially the baked chicken washed down with the homemade rum punches from the full bar. The staff at Taimi are so kind and friendly as well! While not exactly a tour, it’s a fun Friday night out that’s been popular for decades. If you stay at the Club, they will provide transport to and from the town of Oistins, about 20 minutes east of Bridgetown. A mix of locals and tourists it’s a laid-back area filled with handicraft booths, a main stage, bars, and fish fry huts. Walk through with an ice cold Banks beer, choose a busy looking fish shack that smells great, and dig in. Most spots have a similar menu, including fried or grilled dolphinfish (mahi-mahi) or chicken, paired with macaroni pie and fried plantains. There are more formal Barbados tours that will guide you around the fish-fry, but I think it’s simple to navigate on your own. When battling the occasional rain shower on the island, having some fruity rum drinks is the perfect situation on Barbados tours. We too, one sleepy afternoon, headed over to the Mont Gay Rum distillery for a quick history lesson and tasting. Mont Gay is popular in the UK and the US as one of the top Barbadian rums that come in a few light-to-dark varieties. While it was interesting to see how they manufacture their spirits, the highlight was simply hanging out at the bar with a knowledgeable tender and some samples. The XO stood out as a rich and smooth blend, so we took a few bottles home! Have a cocktail or two as well before you leave – The ‘Spice of Life’ made with mango puree and passionfruit was beautifully tart. The Skyscanner app will offer you the best flight prices no matter where you’re flying from. There are direct flights from Gatwick Airport in London every day to Barbados, as well as direct flights from New York City via Jet Blue. Taxis are unionized in Barbados. It’s a good thing, as you’ll know what you’ll pay from the airport for a ride because it’s standardized. Hotels are not allowed to send their own private transport. Driving is easy around the island too if you prefer to rent a car. The Club was our first choice, but there are other properties on Carlisle Bay and beyond if you’d like to split up your trip. The west and southern coast are the most popular from its beaches, snorkeling, and things to do. Fresh fish is everywhere if that’s your jam! Skip imported salmon and go for local white fish, like Mahi Mahi (dolphinfish on the menus) and fried flying fish. Caribbean lobster can be found at Oistins and at most resorts for a cost. All fish and the jerk chicken goes well with the traditional macaroni pie and plantains, or salad and rice/beans. We had some laid-back fun the last evening at Blakey’s on the Boardwalk in Christchurch for live music and fresh fish. In Bridgetown, the Coffee Barbados Café just up the hill off the beach is a wonderful breakfast spot surrounded by greenery al fresco. Don’t forget to get a five-dollar fish cutter to-go at Cuz’s if in Carlisle Bay too – fresh grilled fish, cheddar and all the fixings. All businesses will take the Barbadian Dollar – there’s plenty who also take credit cards. However, many taxi drivers and restaurants also accept the American Dollar. The exchange is roughly one American Dollar to two Barbadian Dollars. Barbados tours booked through the hotel may be your best bet to finding the best rate. Shop around as there are several companies offering catamaran tours, snorkeling trips, deep sea fishing, and many more adventures. Have you been to Barbados? What’s your favorite place in the Caribbean? Would you prefer one of the all-inclusive resorts in Barbados or a more a-la-carte vacation? I was also skeptical of tours purchased via a hotel, but we were given discounted rates when our hotel called the tour company on our behalf. I have been to Barbados twice, but both on cruises. I enjoyed the island both times and would love to do an all-inclusive. For relaxing, lazy island trips I tend to prefer all-inclusive. The Mont Gay Rum distillery was really cool, but my favorite was the catamaran ride and swimming/snorkeling with sea turtles. My featured image on my homepage was taken on this trip! 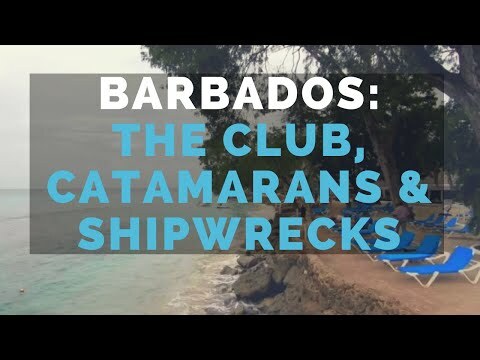 I would definitely stay at The Club and consider it a top choice for Barbados! I have the weirdest family memories of Barbados. You have to understand, my mother was an international poultry consultant. Yup, PhD in chicken plucking (actually developmental physiology but whatever). We went with her to work in Barbados when I was 9 or something. I can still remember the smell of piping chickens on the farm to pass time on the trip. This is where you cauterize the tip of their beak so they don’t peck each other. Smells like burning hair. Yup, that’s my childhood for you. Anyway, we love all inclusive resorts in the Caribbean, especially if there is diving include (and lot’s of rum punch). There is always something fun to do so you don’t end up playing with the chickens. OMG, that Rum Bar looks so so good! I really love the first photo of the shore from The Club, that rainbow….I mean, how much better of a photo you could get! I usually love salmon, but the tip about the Mahi Mahi sounds delicious. Wow! It looks fantastic! I like meeting some locals when I travel and going into Oistins for an evening sounds fun. That’s one thing I always worry about when I consider all-inclusives: will I see much else besides the resort? I’m usually more an a-la carte girl, but there’s something to be said for not having to figure everything out when you’re on a Carribean getaway like this. Oooo the Rum Tour. I would totally sign up for that! I am not into rum but would love to give it a try. The Caribbean is an unexplored territory for us but I have heard of Barbados quite a few times this year for different reasons. Would love to plan a scuba diving trip there! Well, your description of The Club sounds perfect to me. I’d love to wake up to a sea swim, followed by the spa and a pina colada. What more could you ask for from a Caribbean vacation? !